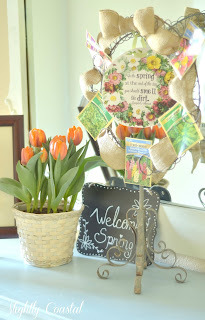 It’s a funny thing about spring decor. 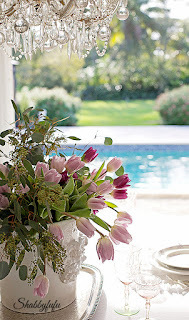 I’ve been decorating for autumn my entire life, and holiday decor is of course ubiquitous, but when it comes to spring, I’ve always focused my efforts on planting outdoors. This year I decided it’s time to change that and celebrate this most optimistic of seasons around my home. 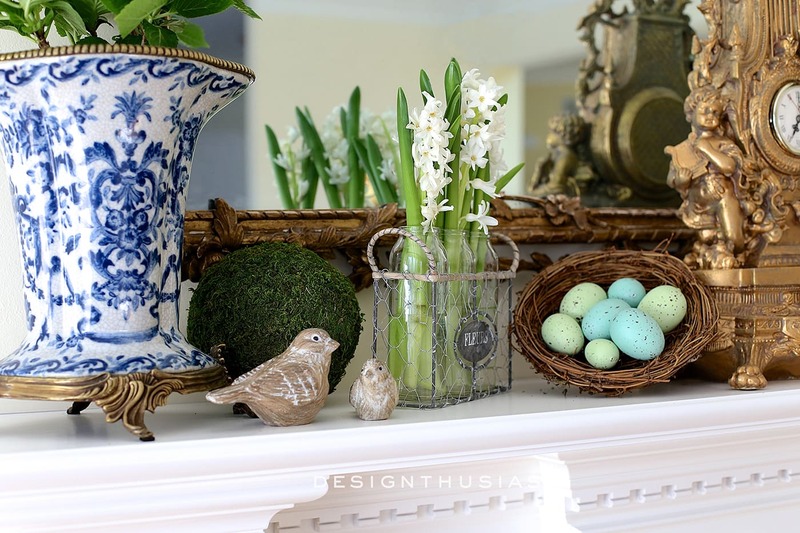 What better place to direct my attention than a spring mantel in the family room? 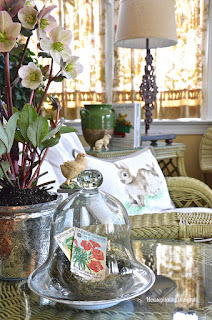 I’ve in fact been peppering our home with springy decor for several weeks now, with gentle touches throughout the house. 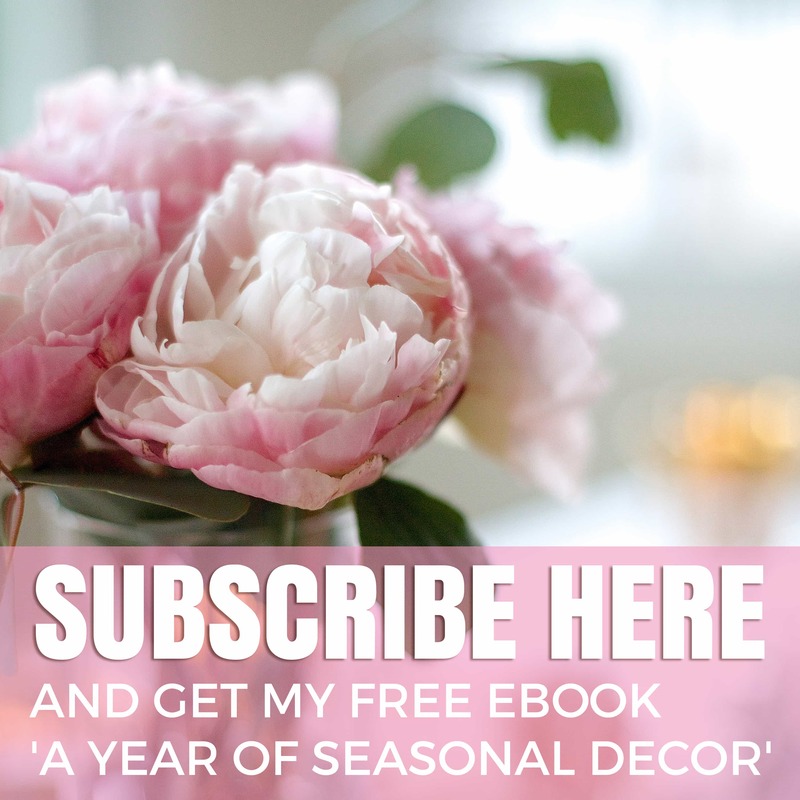 It’s actually curious that I’ve ignored this season in the past when the soft light colors and ever-present flowers are exactly what I love most in decorating a home. 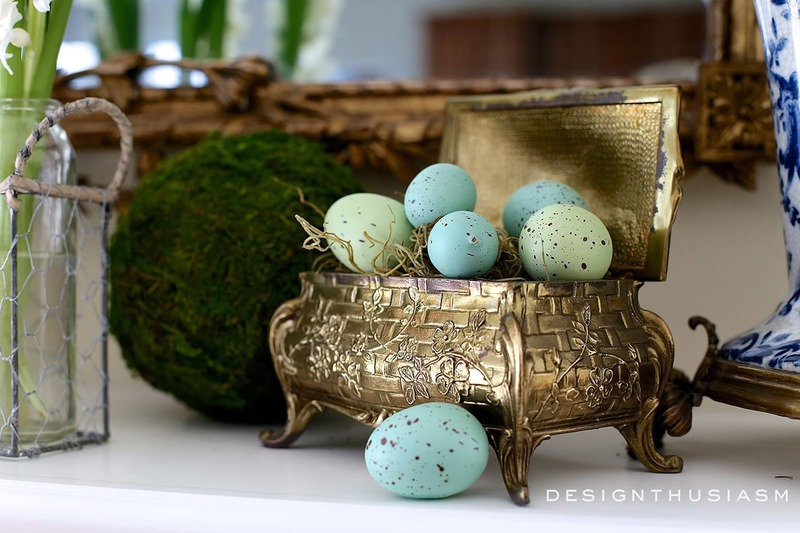 In styling this vignette, I wanted to underscore the renewal that spring represents, so I started with cheery toned eggs tucked into one of my vintage boxes. Our mantel itself is a lovely new piece we added to our home a few months back. I enjoy its classic lines and traditional detailing and it seems to work with many different looks. The gorgeous French antique mirror that sits above it is a favorite new acquisition of mine since we moved into this house. 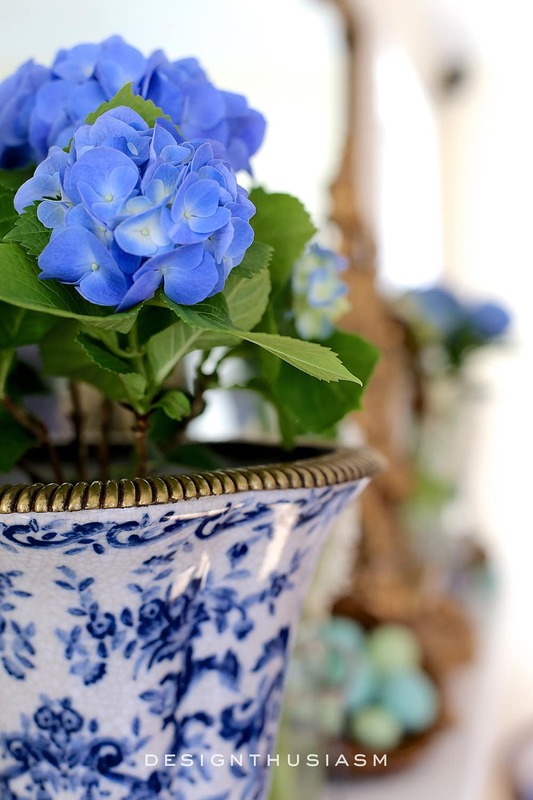 Flanking the mantel on opposite ends, I keep these wonderful blue and white chinoiserie vases with ormolu detailing and for this setting the perfect addition was rich blue hydrangeas peeking over the sinewy edges. With eggs and a nest present, sweet little birds can’t be far behind. These chippy wooden pieces are exactly what was called for and the mossy orb behind them is another nod toward reawakening nature. Next to the fireplace we keep a pretty French chair and here it’s dressed with a blue and white toile needlepoint pillow. 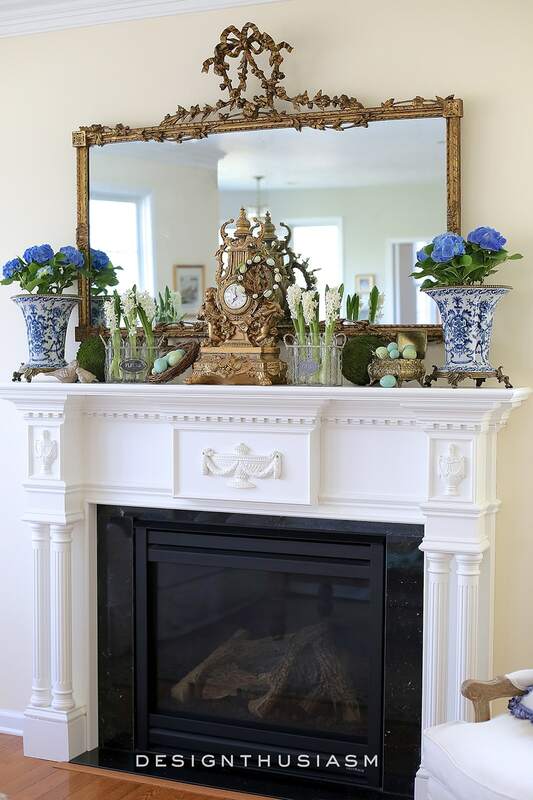 The full view of the mantel is delightfully upbeat, the reason I love spring so much in the first place. 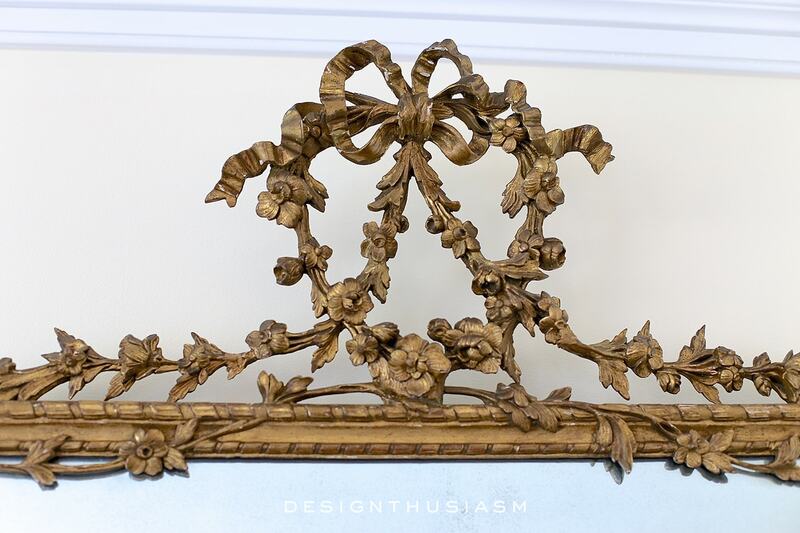 You can see the detail of the delicately carved mirror, which when viewed in this seasonal context, one really notices the viney florals laced around the frame. 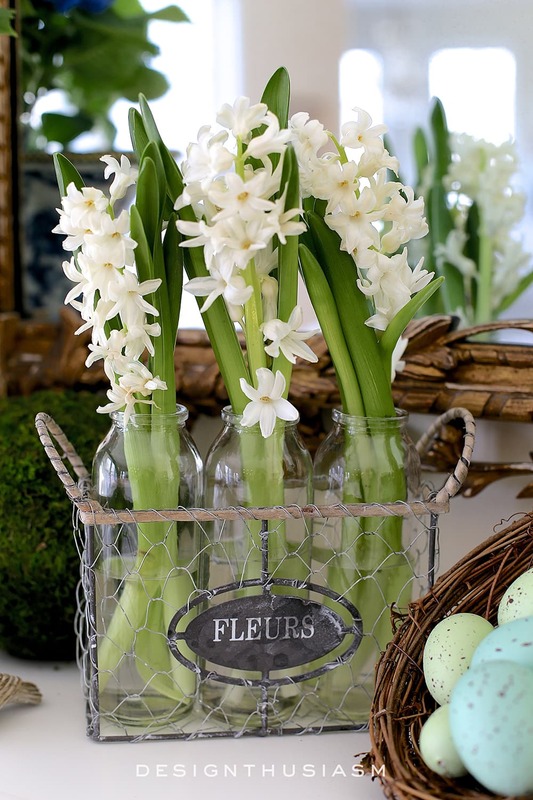 Among my absolute favorite flowers are hyacinths, which I buy the second they’re available for their intoxicating scent. I find myself lingering in any room they’re in, because I simply can’t get enough of them. Across from the mantel on our coffee table, the spring color palette is continued with a French country milk bottle and linen napkins. 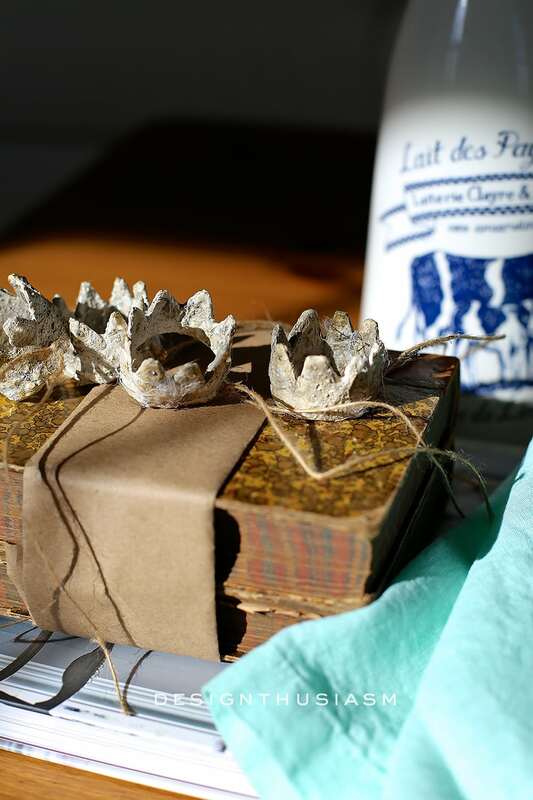 The wonderful crowns are from my blogger friend Dore’s Etsy shop, called Burlap Luxe. I forgot to mention this is my first photo shoot with my brand new camera, so I’ve been enjoying the light this camera captures. Draped over an edge of the gilded clock is a nest and egg candle ring which ties all the imagery together. 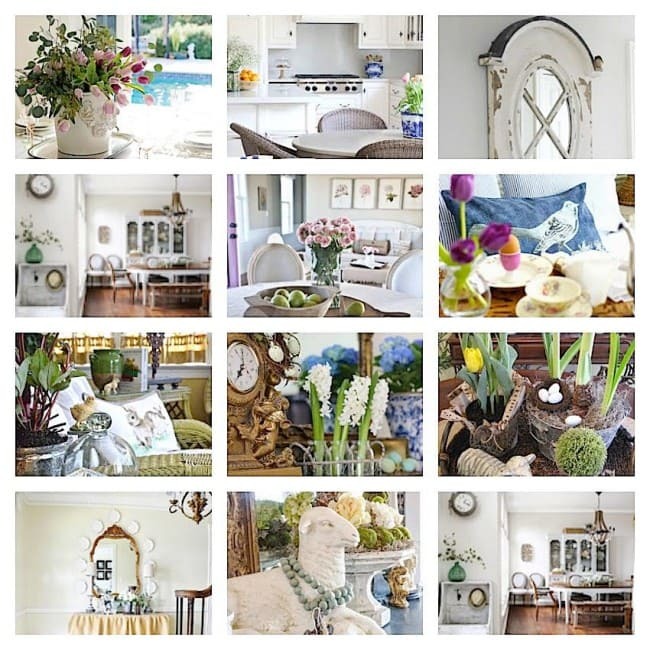 In addition to our family room, you can visit a few more of our rooms decorated for spring. 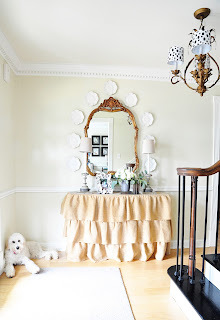 Below is the breakfast room which you can see more of in Noontime at My French Kitchen Table. 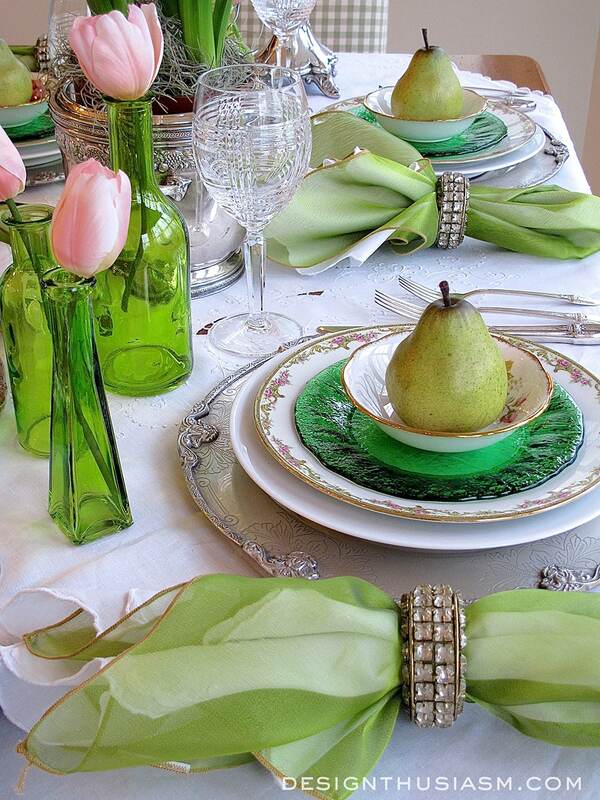 I also did a full spring table setting that you can visit at An Elegant St. Patrick’s Day Tablescape. 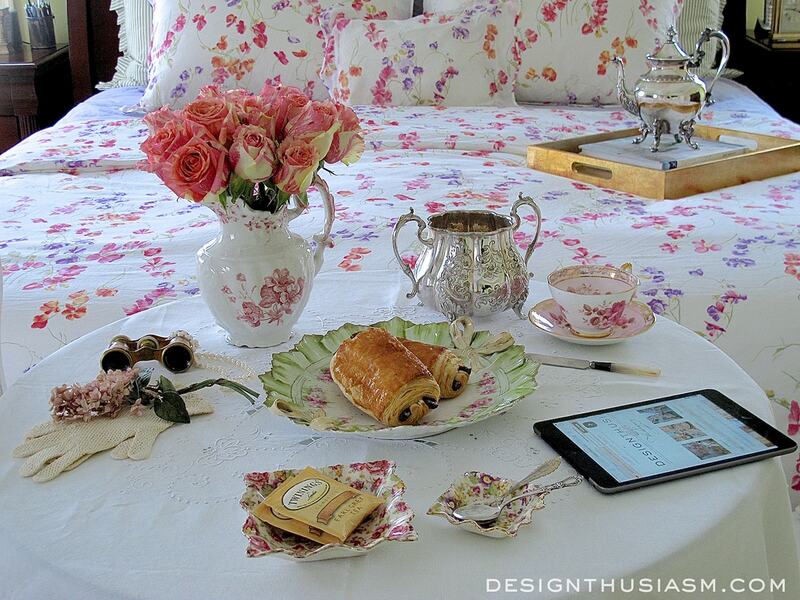 You can also peek at spring in our master bedroom in Waking Up to Croissants and Coffee. 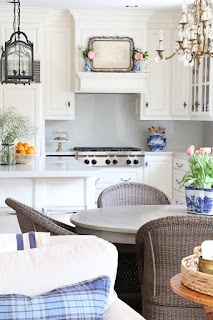 I’m joining in today with a talented group of friends for a SPRING Home Tour and Design Party and I hope that you can visit their inspiring posts! 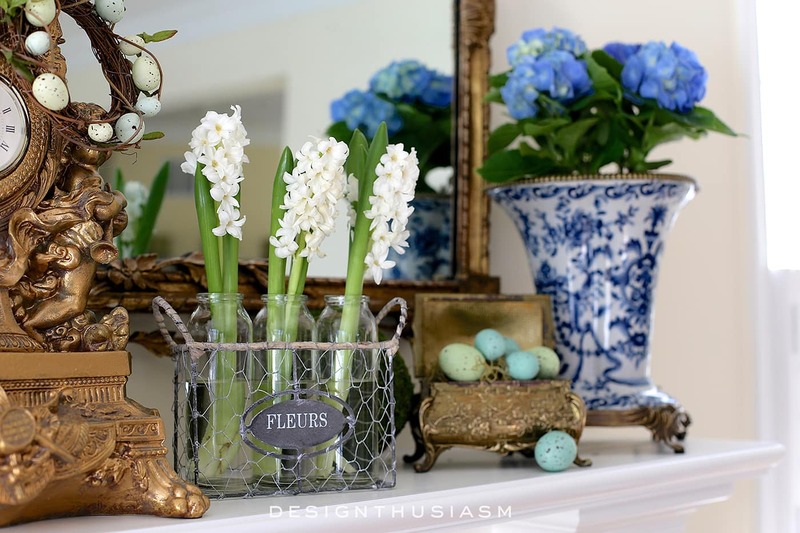 Lori, I am in love with how your Spring mantel came out~its beautiful, I love the mix of rustic and luxe and the French details. It all looks so beautiful, Lori! So fresh and feminine and elegant. I love your style. love and blessings for a wonderful Easter! 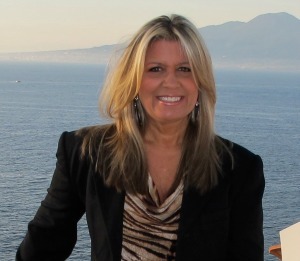 Thank you so much, Lynda! I so appreciate your frequent visits and that you take the time to comment… 🙂 Have a wonderful Easter weekend!! Lory…as always, a most beautiful and elegant mantel! 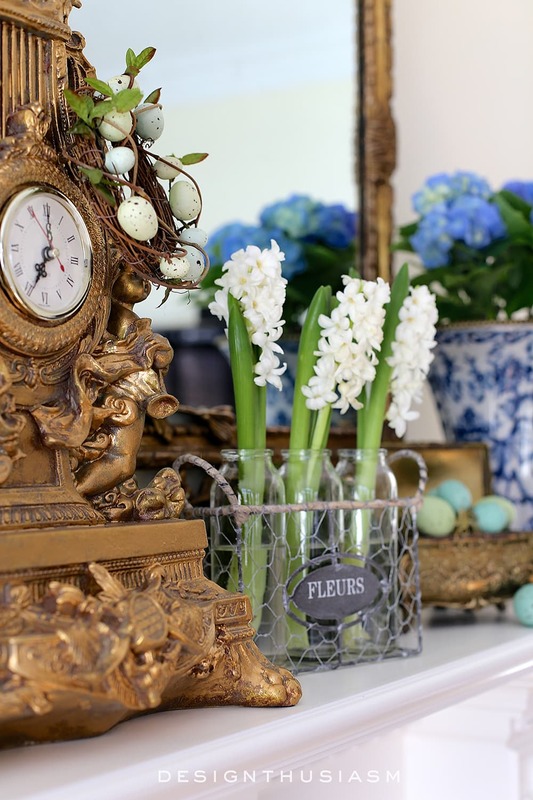 The clock is exquisite and loving those gorgeous blue and white urns/planters….Have a most wonderful weekend!!!…. Thanks so much, Shirley! So happy to be sharing this party with you!! Funny thing about that clock… I tend to walk around my home with gold paint, gilding everything in sight. When I bought it, it was a dull shade of gold and I wanted to add some lights and darks, so gilded it became… 🙂 Have a Happy Easter!! Thanks so much, Debbie! 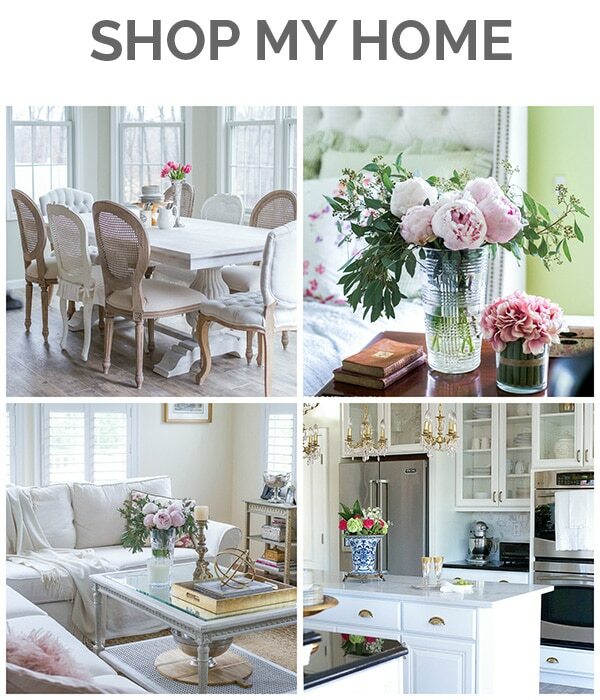 I, too, am enjoying seeing the homes of bloggers with the same taste and aesthetic I have. It’s actually a delight at a time when so many are going mid century modern. No surprise you like the blue and white… I love yours too!! Delighted to be sharing this tour with you. Enjoy your Easter weekend!! Thanks, Janet! While I absolutely love mirrors, it’s sometimes difficult to photograph them with the curious things that wind up being reflected. Not a problem when working with flowers… 🙂 Thanks for the lovely words! It’s a delight to be partying this spring with you. Enjoy your Easter weekend!! Seriously stunning, Lory! 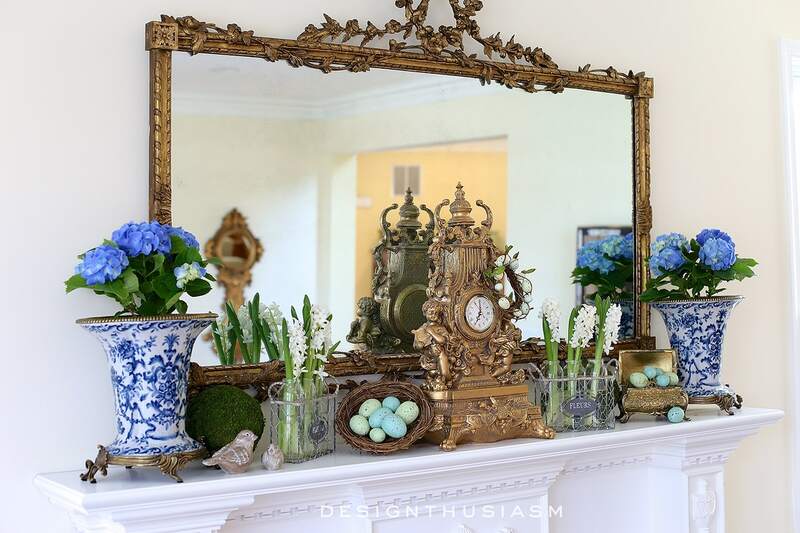 Your mantel just exudes spring and I LOVE that mirror!! I hope you have a wonderful weekend and a Happy Easter! Thanks so much, Kim!! 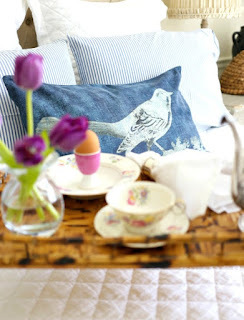 It’s a pleasure to be sharing this tour with so many talented bloggers and to see others who share the same aesthetic… 🙂 Have a wonderful Easter weekend!! What a beautiful mantel! I love the blue and white. It all looks so elegant and refined. Lovely. Thanks so much, Nancy! It’s funny to see how many of us are fans of blue and white. Enjoy a wonderful Easter weekend!! 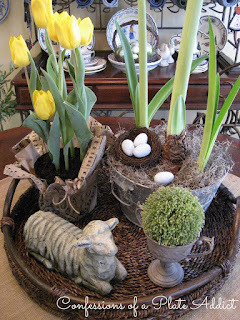 Lory, your Spring mantel is absolutely gorgeous!! I am in love with every detail! Thank you so much, Cindy! While it’s always nice to receive kind comments, receiving them from bloggers whose work you admire is all the better… 🙂 Have a wonderful Easter weekend!! Thank you so much, Emily! 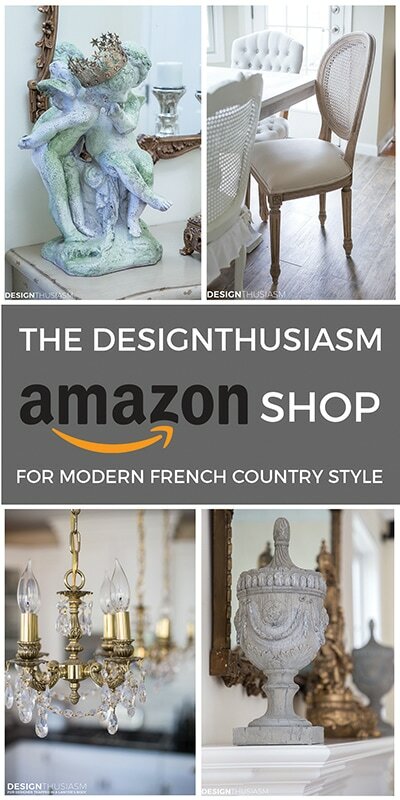 I agree it’s a pleasure to be included with this talented group… 🙂 I look forward to many more French Country link parties!! Most beautiful of spring mantels! 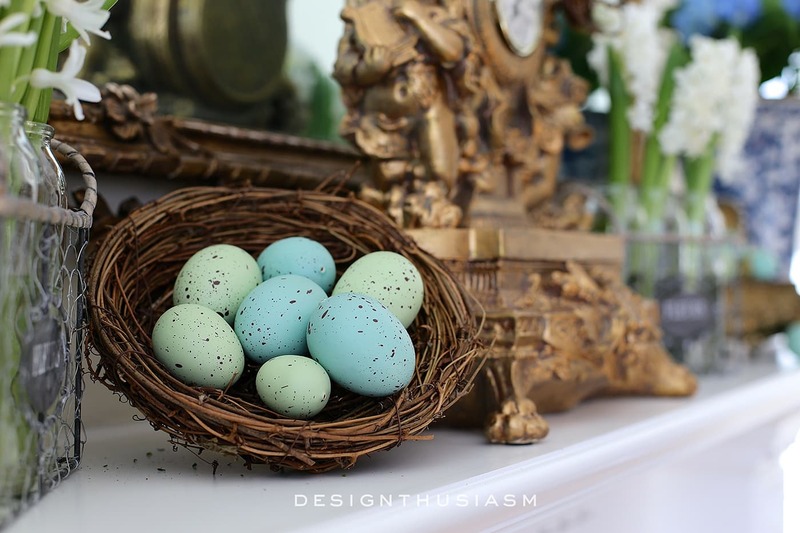 Reminds me of a line from a Robert Louis Stevenson poem, “of speckled eggs the birdies sing and nest among the trees……..”. Thank you Connie! What a wonderfully poetic observation… 🙂 I can’t think of a lovelier comment!! Thanks for visiting! 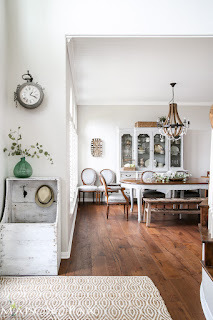 Sigh….that amazing mirror!…those gorgeous clocks!…that beautiful new mantel! All my style and just perfectly arranged! 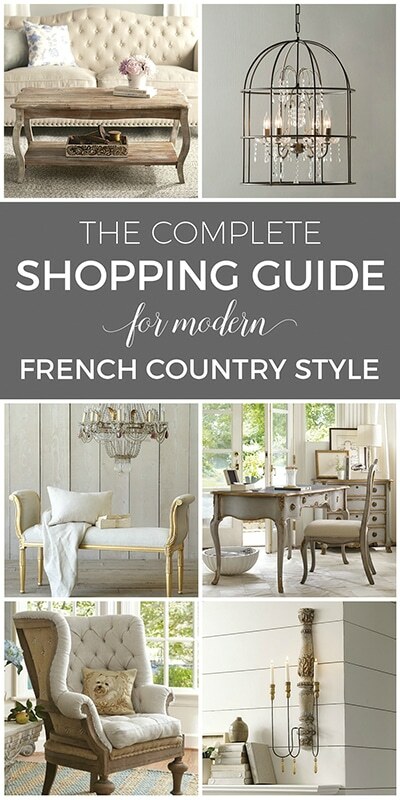 Love your design style! Have a happy Easter! Thank you so much, Jana! And right back to you!! 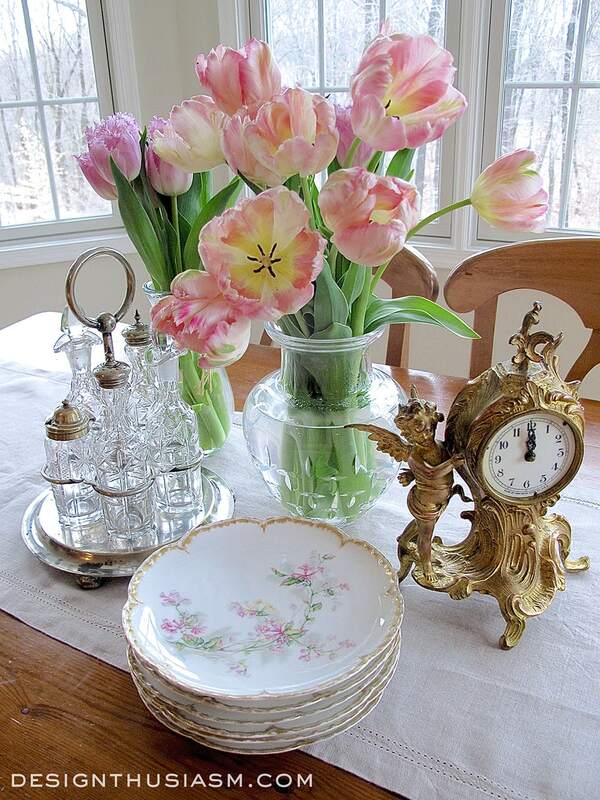 Your Spring mantel is beautiful, fresh flowers are my favorite part of Spring! I love all of your gorgeous photography and that mirror.. swoon!! 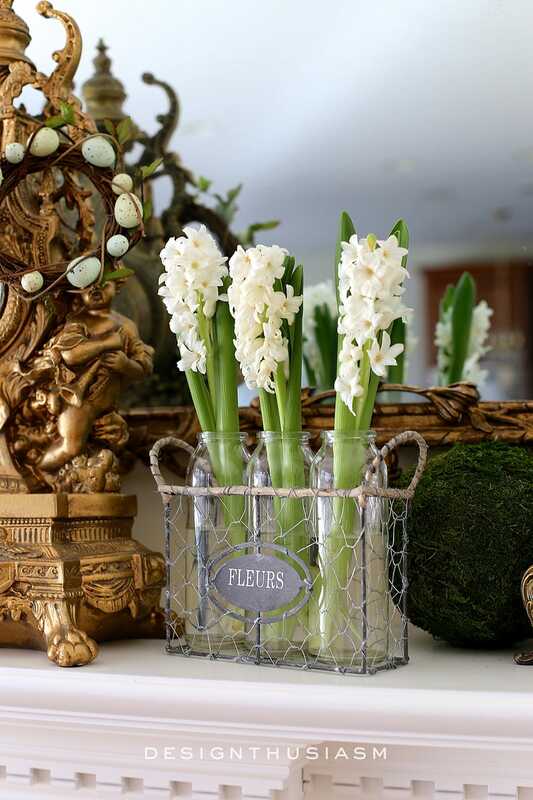 Every aspect of your spring mantel is perfectly beautiful Lory. It must fill you with such joy every time you pass it. Thank you for sharing it at Shabbilicious Friday. I’m delighted to be featuring it at tomorrow’s party. 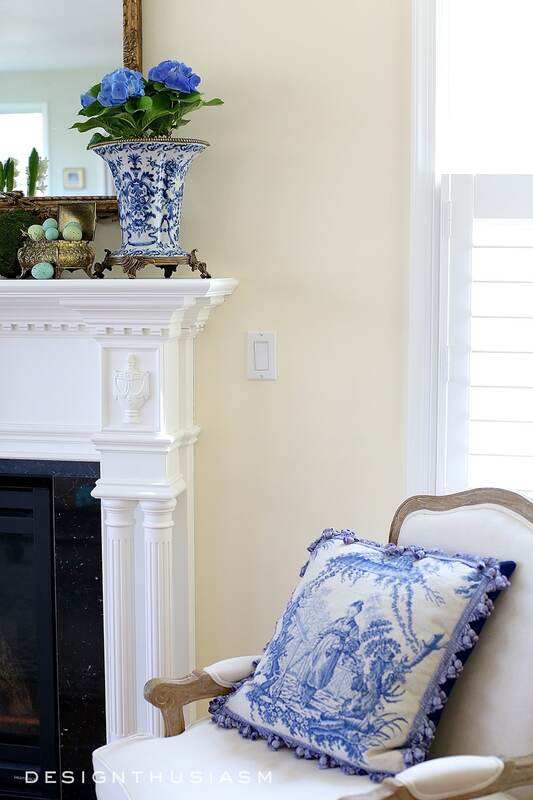 Love love the blue and white on your mantle! It is such a classic crisp look! Thanks, Lisa! Blue and white seems to really resonate with people… 🙂 It’s a happy combination!! Thanks for visiting! This was such a beautiful tour of your exquisite mantle. I am still swooning over the mirror and your photography! Love your post you shared at Dream Create and Inspire! It was prefect for our party! I will share this on Dream Create and inspire Pinterest board, please stop by my way and say hello, would love it. 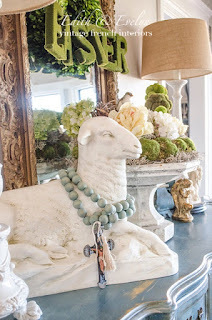 Lory, I always love your mantel but it’s especially beautiful dressed for spring. I’ll be sharing this on Facebook tomorrow. Such a beautiful mantel! 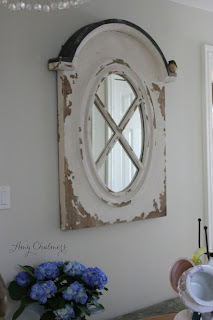 I’ve picked this project as one of the features for this week’s #MondayFundayParty. 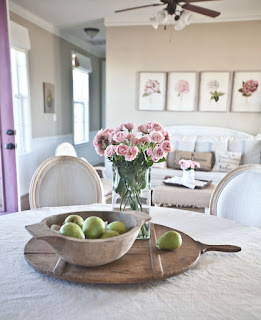 http://www.100directions.com/pretty-decor-food-ideas/ Thank you so much for sharing! Hi Lory, I have fallen in love with you mantle! I will be featuring it at SYC! Thank you for sharing. 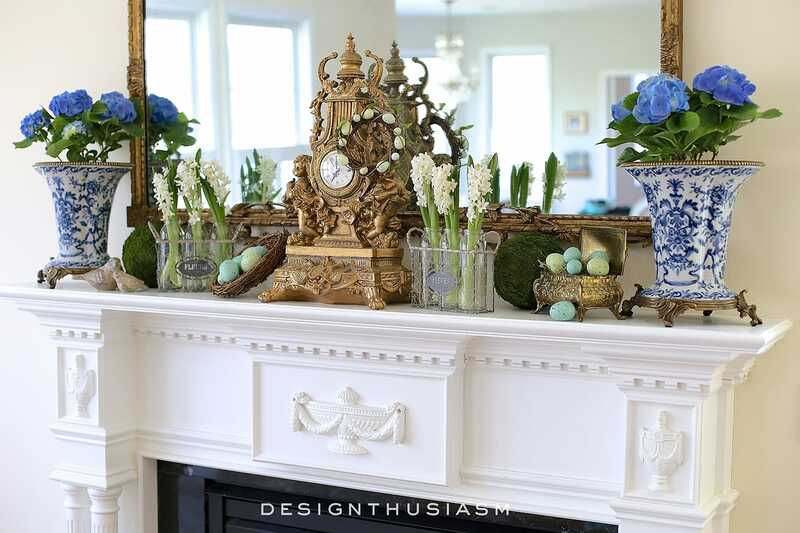 Oh my goodness, I am in love with your mantel Spring décor! I love all the elements used here, specially the blue and white. Your mirror is to die for! I have a wood mantel, so sometimes it doesn’t show as much as a white like yours do. Thanks for sharing. I just subscribed to your book.